Background subtraction to detect moving objects. This background subtraction algorithm learns, over time, a statistical model of the appearance of a scene when the camera is not moving. Any moving object entering the field of view will then be detected as significantly different from the learned pixel model. You can thus use this module to detect moving objects with a static JeVois camera. This module is quite robust to image noise since it learns a statistical model of the distribution of "normal" values a pixel may take over time, as opposed to more simply subtracting one camera image from the previous one (which would be much noisier). When nothing moves, you should see the right side of the video progressively fade to black. This is the result of this module learning the normal range of RGB values that each pixel may take over time, given sensor noise, small variations in lighting, and other environmental factors. Now move your hand or some other object in front of JeVois. It should be detected on the right side of the display and should show up in white color. Note that the autogain and autoexposure features of the JeVois camera sensor may trip this model. For example if you suddenly present a large white object in front of the JeVois camera that had been looking at an overall dark scene for a while, that bright white object might trigger an automatic reduction in exposure, which will in turn brighten the whole image and make it appear much different from what it used to be (so, everything might briefly turn white color in the right panel of the video display). To avoid this, you may want to use this module with manual settings for gain, white balance, and exposure. Note that this class has internal state (it learns the statistics of the background over time). Definition at line 79 of file DemoBackgroundSubtract.C. Definition at line 83 of file DemoBackgroundSubtract.C. Definition at line 88 of file DemoBackgroundSubtract.C. Definition at line 91 of file DemoBackgroundSubtract.C. 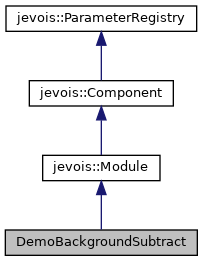 References jevois::rawimage::convertToCvBGR(), jevois::RawImage::height, itsProcessingTimer, jevois::rawimage::paste(), jevois::rawimage::pasteGreyToYUYV(), pMOG2, jevois::RawImage::require(), jevois::Timer::start(), jevois::Timer::stop(), jevois::RawImage::width, and jevois::rawimage::writeText(). 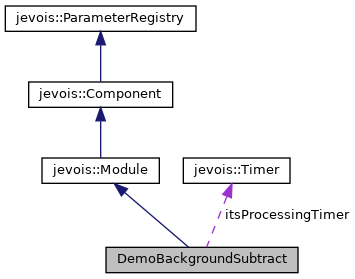 References jevois::rawimage::convertToCvBGR(), jevois::RawImage::height, itsProcessingTimer, JEVOIS_REGISTER_MODULE(), jevois::rawimage::paste(), jevois::rawimage::pasteGreyToYUYV(), pMOG2, jevois::RawImage::require(), jevois::Timer::start(), jevois::Timer::stop(), jevois::RawImage::width, and jevois::rawimage::writeText(). Definition at line 135 of file DemoBackgroundSubtract.C. Definition at line 136 of file DemoBackgroundSubtract.C.